A message of sympathy for the victims of the flight MH17 disaster. THE SEARCH FOR remains of victims of the Malaysia Airlines Flight 17 disaster in Ukraine has been called off by the prime minister of the Netherlands as he said it is too dangerous to continue. At a press conference in The Hague today, Mark Rutte praised the effort of the recovery mission so far and promised victims’ families the search would resume at some time in the future. Flight 17 was shot down in Eastern Ukraine on July 17, killing all 298 on board. 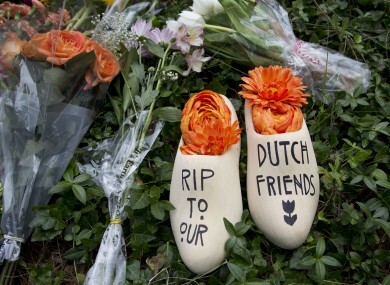 Around 228 coffins have been returned to the Netherlands. “There was an intensive search in the area with 800 volunteers,” he said. The Dutch led-international recovery team that arrived in the area later has not found a large number of human remains. Due to the ongoing delays, investigators said today that they will miss the deadline to file a preliminary report into the cause of flight MH17′s crash. International regulations require investigators to file an initial report with the UN’s International Civil Aviation Authority within 30 days of an accident, however, investigators said they need more time. Email “Search for remains of MH17 flight victims called off ”. Feedback on “Search for remains of MH17 flight victims called off ”.